"Happy" the Nile hippo has a good reason to be sad right now. The National Zoo has cast the 5,000-pound creature out of the only home he's ever known. No word on whether he got his security deposit back. Happy was born at the National Zoo on Jan. 4, 1981, and has spent his 28 years cavorting with the zoo's three elephants and a pygmy hippo. But the zoo sent Happy packing Monday morning, to make room for its upcoming Elephant Trails habitat. The new set-up -- now under construction -- will accommodate a herd of elephants once it opens in 2011. Happy was transported in a custom-made, steel-framed crate built by zoo staff. We always just kept our hippos in a cardboard box. Then again, our hippos were plastic, hollow and ate marbles. To prep for the journey, Happy was trained to enter and stay calm inside his fancy crate. We wonder if he would have still stayed calm if they'd explained to him he was eventually being forced to move to Milwaukee, land of nasal talkers and eight-month winters. 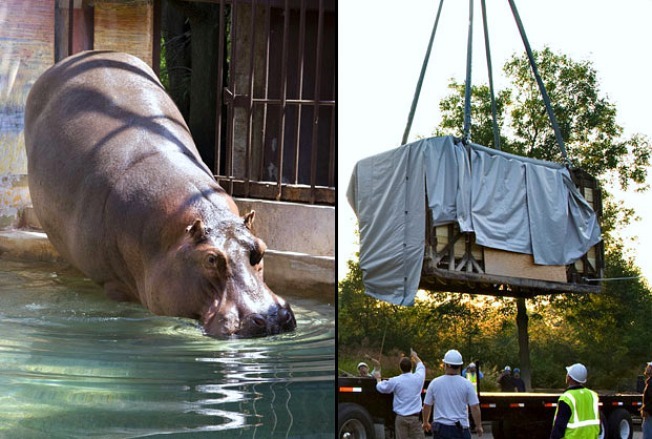 On Monday morning, the five-ton contraption was lifted, via crane, onto the back of a flatbed truck, which left the zoo at 9:35 a.m. Happy arrived at the Milwaukee zoo at 3 a.m. and is now quarantined in their indoor hippo holding area for the next few weeks. Happy is keenly sensitive. Therefore, our expert animal care team deemed it necessary that we limit any disturbance and deviation from his regular schedule in order for the hippo to voluntarily enter his transport crate. So, he's "keenly sensitive," and you're kicking him out of his birthplace. Next thing we hear will probably be that Happy's drowning his sorrows in Schlitz, the Beer That Made Milwaukee Famous. However, there's a silver lining in this for Happy. He's headed off to a cooperative breeding program that will match him up with two female hippos. Nile hippos can live up to 45 years in the wild and longer in zoos, so we're guessing Happy has many happy years of bigamy ahead of him.